I am a passionate free-ride Windsurfer and Stand Up Paddleboard racer and surfer. I’m pleased to say that I am supported by Fanatic SUP, K66, ION and LAR Water sports. Great article on my family from UK SUP Magazine. Thanks Guys. Phil Plume is husband, dad and regular fixture at stand up paddle board races around the coast. Fanatic supported, his family is made up of three offspring and one long suffering wife. The kids are regularly in the water, paddling, surfing and having fun. We caught up with the Plumes to get the lowdown on their SUP antics. Where’s home and your local SUP put in? All – Home is about 30 mins from the coast in Midhurst. Local SUP put ins are Bracklesham Bay, Pagham and West Wittering in West Sussex on the south coast of England. Tell us how you all discovered stand up paddle boarding? They say that your perception of time is directly linked to the number of memories you are making. A day that creates lots of new memories flashes by at the time, but when re-run as a memory seems to have lasted for ever! This means that the key to living a long fulfilling life is the creation of memories. Last weekend the kids and I attended, and I was involved in organising, the 2016 SUP Armada. A memory generation machine! SUP Armada is the brain child of Dan Charlish, and was born in 2014 out of the despair of a windless weekend on the pre-existing kitesurf Armada. 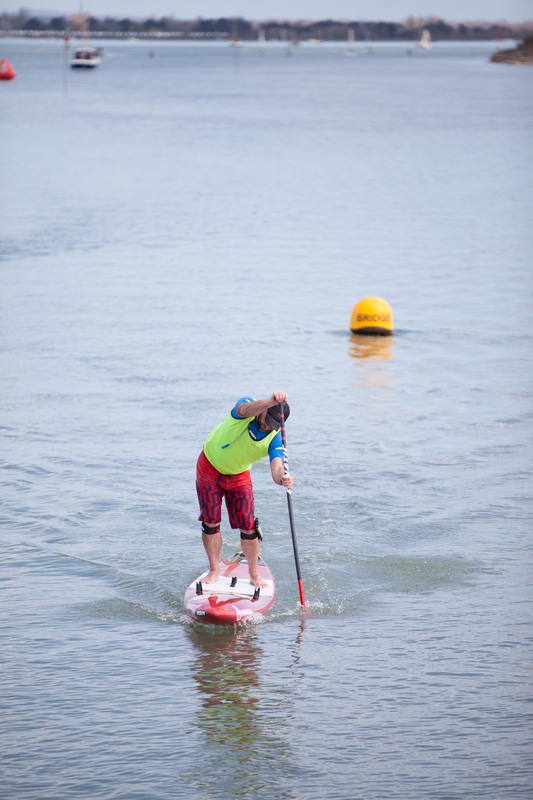 The key idea of the Armada is to break the Guinness World Record for the longest parade of paddle boarders over a 1 mile course, while raising loads of cash for the Armada’s charitable trust. This year was an evolution of the format to include Racing, Yoga, Trade show, tasters and onsite camping. It also happened to coincide with a weekend of amazing weather. The 2016 event also included a change of venue to the beautiful Bewl Water in Kent, a man made and very picturesque lake on the Kent Sussex border. Bewl has fantastic facilities, complete with adventure playgrounds, cafe, and a perfectly formed beach and lawned area from which to stage the racing and other events. 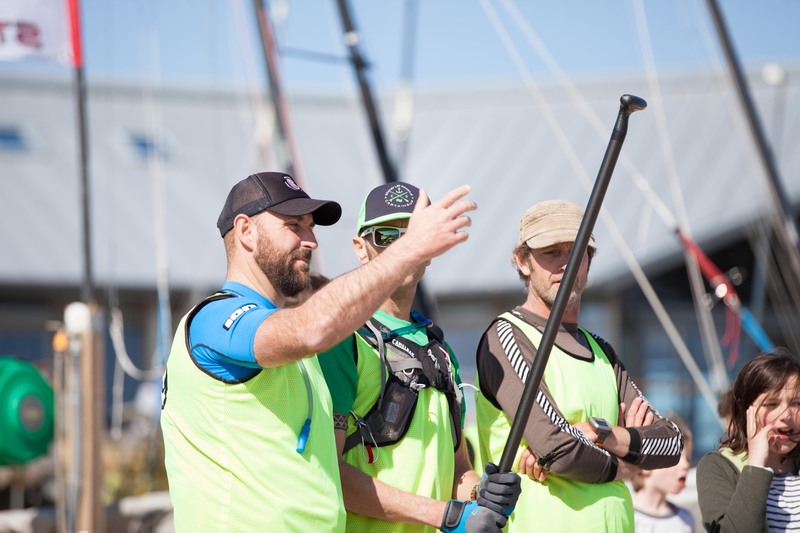 I was asked by Dan to get involved in the racing element of the Armada by acting as race Director to stage 4 of the UK SUP Clubs race series, which would be held at the event. I have only done this once before with a handful of competitors, so stepping up to manage over 60 racers, with series points at stake had the memory generation equipment in overdrive. The planning before the event paid dividends, with both the 6km technical and 1km sprint races running bang on schedule and like clockwork. 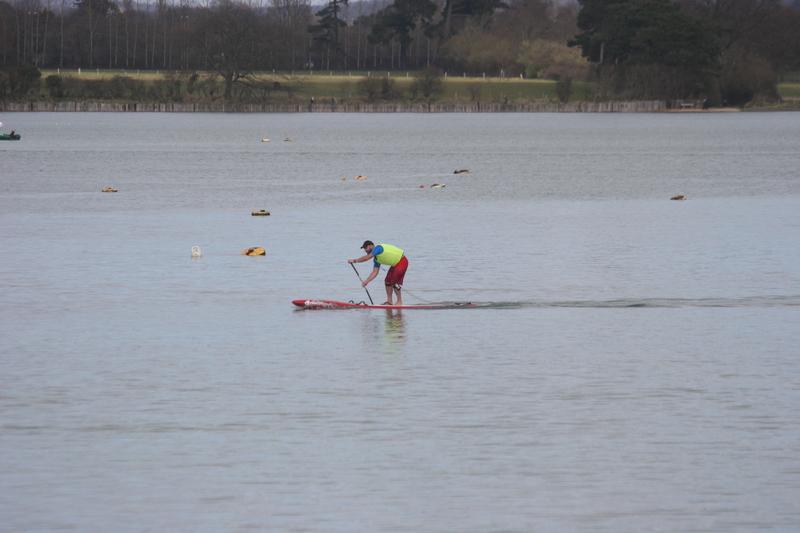 Aside from the UK SUP Clubs racing, many new paddlers took the opportunity to try out paddle boarding with SUP taster sessions run in the safe waters just to the left of the race area. Teams of between 6 and 8 took on the megaboard challenge racing together around a short course with no rules on which way to turn around the marker buoy; cue the carnage and smiles. All the while SUP yoga sessions were taking place just off the beach using Fanatic’s awesome Fly Air Fit platform. The Red Paddle Junior racing was a highlight of the day. The future of UK SUP racing battling it out in front of the crowds for honours in the age categories under 10, under 12 and under 14. It wasn’t all about racing for the kids though. In fact kids of all ages, including my own, just had a ball playing in the water, on boards and in Bewl’s fantastic playgrounds. All the while recreational paddle boarders were just having fun paddling around, having fun and soaking up he atmosphere, as well as a healthy dose of Vitamin D.
At 15:00 the main event started, boards were queued up on the beach and paddlers waited patiently for their chance to break a Guinness World Record. Super mario bros, Iron Man and a number of assorted caped individuals were spotted paddling. With some great scenes of comradery as more proficient paddlers helped others around the 1 mile course; and the result? well we did it! We broke the Guinness World Record for the Longest Parade of Paddleboarders with 390 paddlers, beating the previous record by 97! What a result!! So the time had come to pack up the Sup village, light the BBQ, or retire to the bar to enjoy a cold one, while watching the last few paddlers enjoying a sunset SUP across the lake. This is the stuff that memories are made of. Well here it is! The start of the 2016 SUP race season! and what a baptism of fire. The race has a long history in the windsurfing world. First staged in 1980 entrants numbered in the hundreds in the races heydays. In recent years the event has seen the inclusion of Open Canoes (OC1) and (OC6) and of course Stand Up Paddle Boards. This year there were 3 categories to challenge all comers. I will be writing about my experience of the Round Hayling Island Race. A real challenge! a full 14 miles of grind around the island. What makes this race so challenging is not the distance, its the variety of tidal and weather conditions experienced along the way. The 2016 edition held on good Friday was no exception. The day dawned bright with a brisk northerly wind. The forecast was for the wind lessen to a light breeze coinciding with the race start, before swinging around through the west to a southerly flow and then strengthening again into the afternoon. As the competitors prepared and attended the pre-race briefing, all eyes were on the wind. would it drop?? As the SUP start time neared I headed out into the choppy waters on my 14′ Fanatic Falcon. The OC’s and then then the windsurfers departed on their races. So now it was time!Just a minute to go! The wind had dropped a little, but nowhere near the predicted speed. Final manoeuvres were made, GPS watches started and everyone lined up along the start line. The green flag dropped and we were off! I got off to a excellent start and paddled into a good position in the lead pack. We soon opened up a lead on the rest of the field while jostling for position. The paddle up to the bridge was pretty comfortable as the wind had switched around to the west providing shelter in the lee of the island. I passed under the bridge in fourth place. Paul Simmons (Starboard) had taken the lead by this point, being chased by Mark Slater (Fanatic) in second and Tim Harley (JP) in third. As we rounded the northern tip of the island and into Langston harbour. The trick here is to stay in the channel and use the outgoing tide to boost your paddling speed. Local knowledge is what pays dividends here, and I started to gain on the lead three. The paddle down Langston was a slog and by this time the wind had swung around a little more so were were still paddling head on into it. The Ferry bridge Inn marks the entrance to Langstone harbour and the western end of the island. The outgoing tide at this point gave us all a welcome boost, and I was within striking distance of the top three. The Ferry point lulls the paddler into a false sense of security, thoughts of ‘almost there’ and ‘nearly done’ race through the mind; however the seafront is often the hardest leg of the circumnavigation and at around 7km, accounts for one third of the total distance. As we rounded the point we were met by waist to chest high waves breaking on the bar. This meant a paddle out wide to avoid the worst of it. Even though I avoided the break, paddling sideways across the swell was a challenge in its-self. I think I can safely speak for every paddler, when I say that the sea front was the most challenging part of the race. The wind was now bolt onshore, not too strong, but just enough to kick up an evil short period wind chop and require constant paddling on the left. This was combined with a small ground swell and backwash off the beach, confusing the sea state even further. It was at this point that I regretted the decision to paddle in shorts and rashy. This was great on the harbours as it stopped me overheating, but resulted is a few chilly dips into the brine. Fatigue and mild hypothermia began to set it, but I wasn’t alone. I could see Mark and Tim also taking dips just ahead of me, Paul on the other hand was storming it and increasing his lead with every stroke. As we progressed along the front Paul and Mark started to pull away from Tim and I. Marie Buchanan (Starboard) who was sitting in 5th started to close the gap behind me. By this point I was really struggling and a final plunge into the water made the muscles across the top of my back, forearms and calves cramp up. This really slowed my progress and Marie managed to overtake me just as we turned back into Chichester harbour and the home straight. Here I managed to catch a few rides from the swell pushing up the channel. Then a final push up against the tide to the finish line outside Hayling Island Sailing Club In a well earned 5th Place. This is a great race Thanks to The SUP Company, Sail Racer and Hayling Island Sailing Club for an awesome, well organised Event. Congratulations to all who took part, and to those who made the podium. The Round Hayling Challenge is a great race, and a great personal challenge for those brave enough to take it on; however as I stated at the top. This is a very challenging race, at a time of year when clothing choices are difficult due to the strength of the sun and temperature of the water. I Personally took two hours to fully warm up and I know of one other experienced paddler who was in the early stages of hypothermia and had to be rescued. Be careful out there guys. Anyone can get caught out. Stand Up Paddle boarding is seen by many as a fair weather sport, something for when the wind is slight and the sun is beaming. However there is a growing band of SUPers in the UK who are getting their thrills from taking their boards out in conditions that are normally the domain of windsurfers and kite surfers. Downwinding is basically the art of paddling down wind; a concept that many of you will be familiar with. Lets face it, paddling down wind (with the wind on your back) is the preferred direction for most. How many really enjoy that upwind slog????? The Idea is to surf the wind-generated swell connecting the bumps as you go. There are different degrees of down winding, ranging from the leisurely ‘drift back down wind after a cruise’, to exhilarating balls to the wall surfing of ocean swells in strong winds. Downwinding is open to anyone, you just have to be sensible about your own capabilities, equipment and level of support. 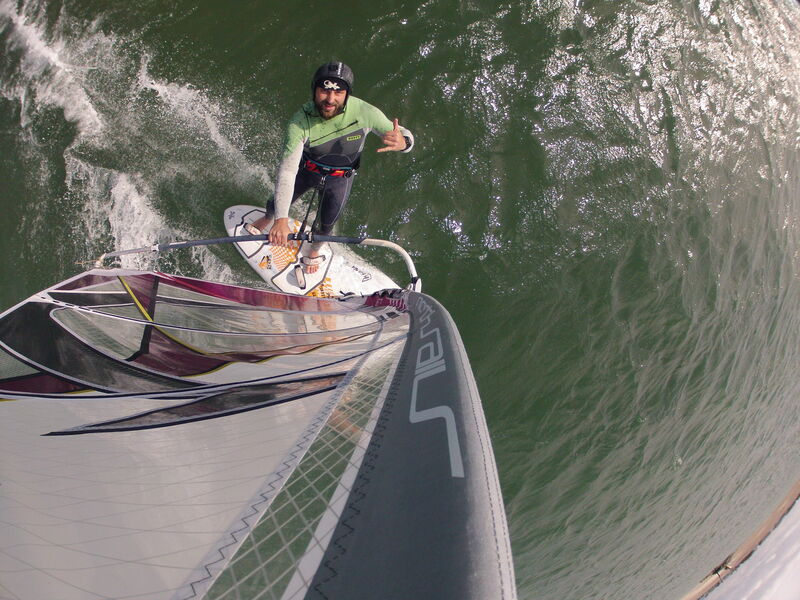 The UK can have some pretty awesome downwind conditions. You don’t have to jet off to Maui and you don’t even have to paddle exposed coastal stretches, as this Inland downwind edit from Charlie Grey, shot just a couple of weeks ago, proves. Safety in Down-winding is paramount. Don’t underestimate the power of the ocean especially when combined with strong winds. If you get this wrong you could get into trouble very quickly. Here are my golden rules for downwinding. Always wear a leash!!!! and ensure it is securely attached to your board. This is so important! Your board is your flotation and your leash your life line. Never paddle without it! It is all too easy for you to get separated from your board and if that happens you are in a world of trouble. Paddle with friends who are experienced paddlers. Find a group and tag along. They will be able to advise you on conditions suitable to your skill level and support you along the way. If you don’t think you can handle it, don’t go out! Remember the conditions never look as rough from land as they do from the water. Understand the route you are taking. Where are the put in and take out points? is there anywhere you can stop and rest if you need to, or be extracted in case of emergency. What are the tides doing and will they help or hinder you if you get into trouble? There are plenty of awesome inland routes for those who are new to downwinding, or if the conditions on the sea are too full on. Consider the use of a Personal Flotation Device (PFD) this could be a life saver. Make sure you are hydrated and fueled and if its a long trip take more along with you. Don’t underestimate how tiring downwind paddling can be. The instability of the board combined with sprint paddling to catch the next swell can be draining. Make sure someone knows where you are, what you are doing and when to expect you back. Dress appropriately a wetsuit or dry suit should be considered for down-winding in the UK. Any board over the 11ft mark can be good for downwinding. Although to really get the best performance a longer all-round race or touring board would be the way to go. Flatter rockered boards may be more prone to ‘pearling’, when the nose dives under water. The longer boards will make it easier to catch those swells and if you really catch the Downwind bug, specific down wind boards are available. So now you know where to paddle, who to paddle with and how to paddle safely; so what are you waiting for? Escape Your Cave and give it a go!!! Its been a great year for Dearne Valley Bulldogs under 10’s team. 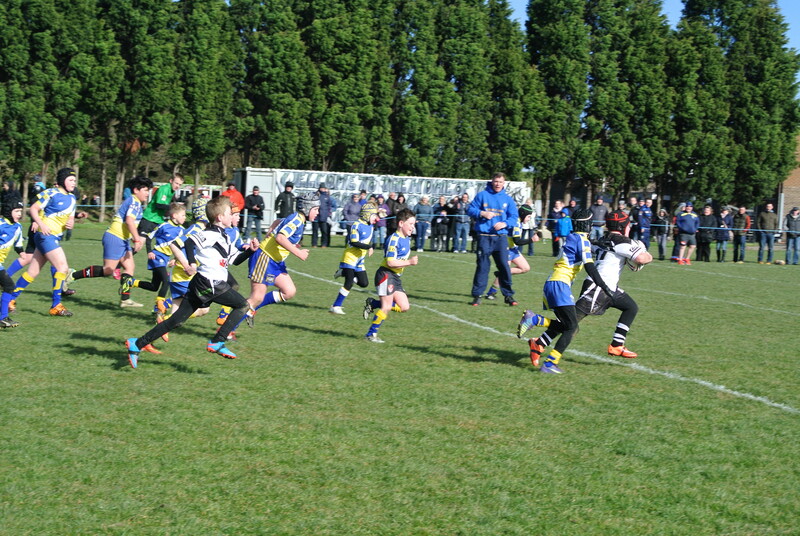 Here at Cave Active we are proud to support an active lifestyle through youth Rugby League, by providing the kids with much needed kit to enable a professional (scary!!!) looking team to take on the best in youth rugby league. I would like to start by thanking you for the sponsorship over the last season. The team were able to get Kit, Match Day wear, Bags, Hoodies etc… Your sponsorship has been fantastic for our team. The season has now finished and what a season it has been! We have grown so much with 11 signed on in March to 18 currently and new kids coming to training weekly. The kids have played every weekend since March and have shown fantastic team spirit and great sportsmanship every game. We are so proud of what they have achieved and they are sure to grow again next season in this fantastic sport. Their friendships have been amazing too, kids who would never meet are now best of friends. Parents too are all part of this and we have built a great community not just within the Bulldogs but within our team. Well done Bulldogs! and get ready for another great season in 2016. If you live in the Dearne valley area and fancy getting involved in Rugby League just click on the link at the top of this post and get involved. That’s all for now. Now go Escape Your Cave!!!! As some of you may know Cave Active is supporting Adam D Short on his attempt to Paddle board the length of the Nile (the longest river in the world) during 2016. Adam is undertaking a series of training paddles to prepare for this awesome challenge. His latest was to paddle the entire length of the Thames, from source to sea. Unfortunately on this occasion the UK weather got the better of Adam and he was forced to pull out of the challenge. Here’s what Adam had to say. A peaceful scene on Day 3 of Paddle board the Thames, however, Mother Nature was about to seek revenge! Severe weather warnings of high winds and torrential rain for the coming week, called for some serious thinking. The decision was made on Saturday evening to bail out of this 2015 challenge. And in the same breath, the decision was made to do a re-run from source to sea in Spring 2016! As a training exercise, the event proved more than worthwhile. Lessons were learned, kit will be reassessed, better prepping re background support etc, and ……the first purchase will be …….a laminated map! Here’s to Paddleboard the Thames 2 with Cave Active on board! We think its great that Adam is already making plans for the spring and agree that sometimes the best lessons are the hardest. 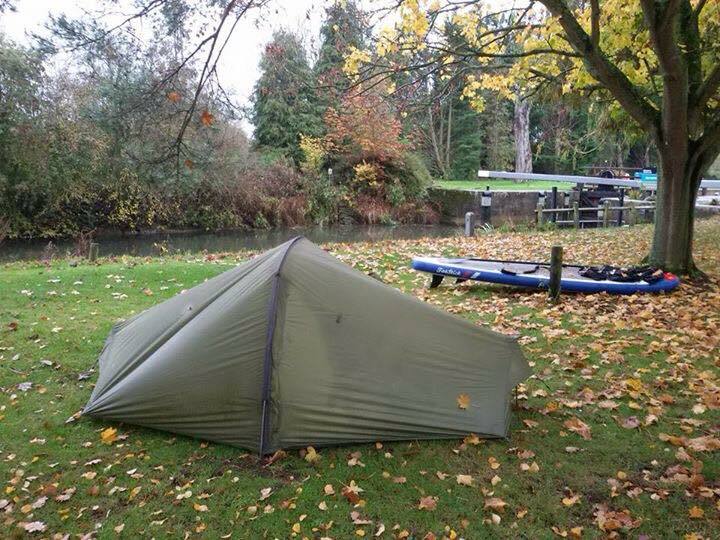 Adam is looking for funding for his Nile paddle so check out his Go Fund Me page, and check back here for more updates from Adam over the coming months. Well that’s it! It’s been a long road, but the new look website and t-shirt designs are finished. I really hope you like them and support the “escape your cave” philosophy by buying them, which will enable me to develop the next stage of the project. Come back to reality and get stuck in! A friend of mine has a days vacation booked today. A whole day away from work, OK It’s not that warm, but the sun is shinning and the wind is blowing. The possibilities are endless; a walk in the park, a stroll down the beach, kite flying, learning to windsurf, Kayaking in the harbour, or mountain biking in the south downs. But wait a minute, what is he doing? He’s been sat up since 12:00 am playing the latest computer game release! He told me he expects to be playing this until around 7:00pm today. That’s 19 hours of sitting in a dark room staring at a computer screen! 19 hours! Now I know everyone gets their kicks from different sources, but this can’t be healthy. I guess if your reading this you’re not one of those people, but if you are I would urge you to go outside, look up into the sky, feel the wind on your face and see that the real world is much more interesting that any computer game. So come back to reality and get stuck in!